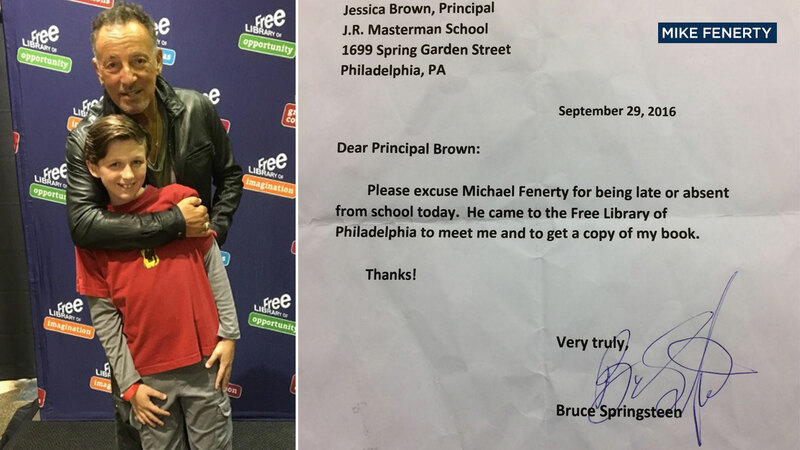 PHILADELPHIA -- A Philadelphia fifth-grader ditched school for a chance to meet Bruce Springsteen and got the best absence excuse note of all time - signed by "The Boss" himself. Michael Fenerty attended a meet-and-greet with Springsteen on Thursday at a book signing at the Free Library of Philadelphia, where the singer is promoting his new autobiography, "Born to Run." Wanting to follow school procedure, the boy and his dad brought a pre-typed absence note for Springsteen to sign. They said he gladly went along with it and signed the note. Michael also got a picture with the rock legend! He and his dad kept the note and made a copy to turn in at school.